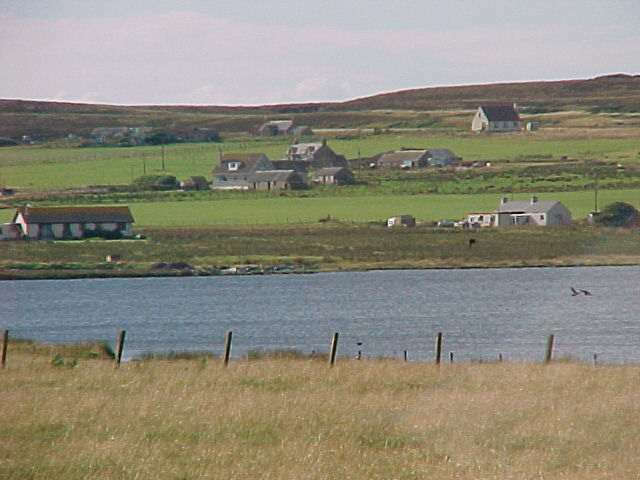 The three largest bays on the coast are Wick Bay, Sinclair’s Bay, and Dunnet Bay. The two first are completely exposed. Sinclair’s Bay, under which designation are included the bays of Keiss and Ackergill, is a magnificent inlet about six miles wide at the entrance. The shore, which everywhere else is bold and rocky, here subsides into low, level, benty links, and sweeps round in the form of a semi-circle; while along the whole head of the bay extends a sand of some four miles in length. The river of Wester, issuing from the loch of the same name, intersects the links nearly in the middle, and then flows into the bay. At one spot near the beach there are two mounds covered with sand, which indicate the ruins of two old castles, named Castles Linglas, and which are supposed to have been Danish or Norwegian strongholds. Tradition says they were surprised and burned down by the natives, and this seems to be confirmed by the calcined state of such stones as have been dug from the ruins. Owing to the want of a light­house on Nosshead, frequent shipwrecks formerly took place in Sinclair’s Bay. There is now a very fine one, with a tower 70 feet high, erected on that promontory. The light, which is revolving, was first opened in the summer of 1849. It is seen 15 miles off, and flashes out once every half minute— alternately exhibiting a coloured red light, and one of the usual appearance, each within a certain range of the compass. A tourist from the south draws the following vivid picture of this lighthouse :—“ It is one of the strongest and best in the kingdom, and will well repay inspection. It commands a magnificent and far-stretching view of land and sea. Seen through its red-stained windows, the surf breaks along the shore of Ackergill Bay in flickering flame. The coast seems one mass of still red fire, and the white gulls, wavering o’er the billows, are transformed into winged splendours.” As the principal Skerry light is apt to be obscured in thick or stormy weather, and at such times cannot be seen at a distance, the light on Nosshead is of great benefit to stranger, vessels, and especially to those from the south that are shaping their course for the Pentland Firth. On the south-east side of Sinclair’s Bay, and about a mile to the west of Nosshead, on a bold peninsular neck of land, are seen the picturesque ruins of the castles Sinclair and Girnigoe, the chief baronial strongholds of the ancient Earls of Caithness of the Sinclair family. The length of the rock on which they are situated is fully three hundred feet, with a main breadth of thirty-four, and fenced on the side towards the land by a long deep creek or “goe” running up to the neck of the isthmus. Of Castle Sinclair, which was erected about the year 1606, as an appendage to Girnigoe, no part is standing except one tall chimney-stalk of the main tower. The rest of the superstructure, owing to some defect in the foundation has fallen down, and being strongly cemented with lime, is seen lying in one solid mass in the hollow between the castle and the mainland. The sides of several of the prostrate arches are of such durable masonry, that they present to the hammer a surface nearly as hard as granite. The date of the erection of Girnigoe, apparently so named from the adjacent goe, is not known. It is, however, notwithstanding its great antiquity, comparatively entire. The main tower, which is about fifty feet in height, consists of five stories, three of which, including the ground floor, are vaulted. Its thick massy walls are solid as iron; while that part of the edifice fronting the sea is built to the very edge of the precipice, and rises up perpendicular with it. On the land side the court was protected by a high screen wall pierced with seven loop­holes. Immediately opposite, on the side facing the bay, ran a range of low rooms, supposed to have been used as barracks for the retainers and domestics of the establishment. There were two stairs inside, both of which are now gone. The great dining-hall would seem to have been a spacious apartment, being about thirty feet long and twenty broad, with a large bow-window in the west end. At the extremity of the tongue of land, towards the east, a stair consisting of a flight of narrow steps cut out of the solid rock, with an arch at the top, leads to the sea. There is another archway at the west corner, betwixt the two castles, evidently for the same purpose; but there being no trace of a stair here in the rock, it is not easy to say whether the descent was through a subterranean passage, or by a portable trap or ladder. At the foot of the precipice at this point is a small goe capable of admitting an ordinary-sized boat. There can be no doubt that the object in getting to the sea in both places was to secure to the inmates of the castle a communication with the mainland, in case of a siege, when all other means of ingress and egress were cut off. A drawbridge over a natural chasm in the rock connected the two castles, the new and the old, together. Hence, in the case of an attack, if the one stronghold was in danger of being taken, the besieged could easily retire into the other. On the land side, in addition to this goe, both were protected by a deep and broad artificial ditch, cut across the neck of the peninsula, over which was the main or principal drawbridge, which afforded access through an arched passage to the court of Castle Sinclair. The situation of this double fortress was naturally strong; and before the invention of artillery, it might with its well-constructed defences, be considered impregnable. On the north side of the bay, opposite Sinclair and Girnigoe, stand the ruins of the castle of Keiss, anciently called the “fortalice of Raddar.” It belonged also to the Earls, and was the favourite residence of the second Earl George. The castle and lands connected with it became latterly the patrimony of George Sinclair, who disputed the titles with Glenorchy. 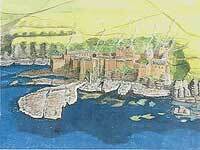 Dunnet Bay may be said to commence between Holborn­head and the opposite headland of Dunnet. It forms a deep indentation, somewhat in the shape of an oblong, and runs down towards the south-east for the space of nearly four miles. Its breadth across is about two miles and a half, and it is completely land-locked on the south side by the low rocky shore of Castlehill and Murkle, and on the north or Dunnet side by the lofty wall of precipices formerly mentioned, amongst which the bluff bold brow of Dwarwick rises up con­spicuously. It is a beautiful inlet, but still a very dangerous one, when the wind blows right down from the north-west. A gale from this quarter throws in a heavy sea from the Atlantic; and, if a vessel should unfortunately get embayed, her destruction, from the great difficulty of working out again, is almost certain. Before the erection of the present lighthouse, scarce a winter passed without one or two shipwrecks. In the darkness vessels frequently mistook the bay for the Pentland Firth, and before they were aware, they struck either on the rocks or on the sand at the bottom of the inlet. In 1811, a very melancholy ease of this kind occurred. A large barque, called the Fingal, of London, with a cargo of wood from America, shaped her course by mistake down the bay. The night was dark and stormy, in the month of November, and the vessel, being heavily laden, struck far out in the sands in deep water, and went almost instantly to pieces. The crew— sixteen in number—all perished, several of them being crushed to death by the logs which were set loose and floated around when the vessel broke up. When roused by a heavy westerly gale the bay, from the tumultuous agitation and magnitude of the breakers, presents a sublime spectacle. The huge, long, white-crested billows, lashed into fury by the storm, seem to chase each other; and as they hurry on towards the beach, burst with astounding force—the broken surge churned into foam rushing up along the sand with the speed of a race-horse, and then rushing back again as rapidly, as if sucked down by the raging flood. Here and there a few gulls, perhaps in quest of prey, may be seen vainly struggling with the blast, while from all sides of the bay is heard one continued roar like that of the loudest thunder. * There is a loch in Strathnaver called Lochmonar, which the common people believed to possess tbe same wonderful healing qualities as the one at Dunnet; and what is curious enough, tbe ceremonies whicb the patients had to go through were the very same at both lochs. There is an old tradition (evidently a monkish invention) which says that on St Stephen’s day its basin was occupied by a pleasant meadow and that on St John’s day the meadow was covered with water. This story of its origin, so akin to the marvellous, would, among a simple and credulous people, very naturally heighten their belief in its supposed curative powers.